I hope they aren't keeping that game outside! (Actually, I'm guessing they probably just bought it and are taking some pics before bringing it inside). Anyway, that's a pretty neat find, and it kind of reminds me of the old Super Mario World pinball machine from ca. 1991 or so that I used to enjoy playing when I had the change. Awesome find! Man, I love pinball machines.....I always wanted the Jurassic Park one. I never did see that Mario World one, but I bet it was cool too. I WANT THAT PINBALL MACHINE!! 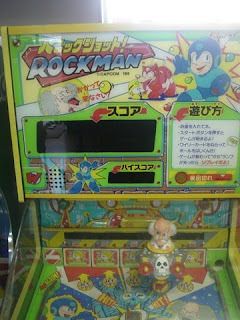 I have to admit that is an amazing find, though Wily looks like his Captain N counter part xD. BTW, it says "Panic Shot" above the Rockman title. That same machine is at an old arcade not too far from my house. They have rare cards inside for people ho get a high enough score. I am not sure if I am just not good at pinball, or the game is way too hard, but my top score was only half of what is necessary to get cards out of there.